Painted Skies Dental Center cares for the oral health of both individuals and families all under one roof. Husband and wife team of Drs. Ramon and Natalie Ortiz combine their expertise for the best family dental practice in Wilton. Who wouldn’t feel at ease in a warm, friendly environment? The staff at Painted Skies creates that for families every day. A relaxing atmosphere, pain- and fear-free services and a gentle attitude preserve your family’s oral health and well-being, too. Our beautiful treatment rooms relax you during dental exams, cleanings, restorations, and cosmetic services. 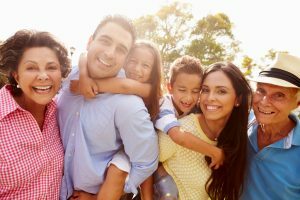 Plus, our family dentists in Las Cruces interact really well with the youngest of patients because they’re parents themselves! They perform complete oral exams and hygienic cleanings and teach the basics of brushing, flossing and tooth-friendly nutrition in a kid-friendly way. Everyone at Painted Skies Dental Center understands that life is busy, and it’s hard to miss work and school for dentist appointments. As such, the office is open five days a week so Mom, Dad, kids and grandparents get necessary dental care without stress. Plus, to accommodate family budgets, the office offers many ways to pay, including flexible financing options. The office staff will process your insurance claims and make sure you receive maximum benefits. The dentists in Las Cruces deliver a wide array of services to keep smiles healthy for a lifetime. When problems arise, modern restorations fill gaps and reinforce and beautify failing enamel. For the attractive teeth and gums, cosmetic services straighten crooked teeth, whiten tooth color and modify shape. Your family dentist advises semi-annual examinations and cleanings beginning in toddlerhood and extending through the senior years. Check-ups spot problems before they become complicated and costly. Digital x-rays uncover hidden decay and any issues with roots and bone structure. We’d love to be your dental care provider. Contact Painted Skies Dental Center to arrange your convenient appointment time. We’re sure you’ll find everything you need all under one roof.